April 11, 2014 – It’s About the Climb! Friends, I feel the overwhelming need to share with you yet another story. While, like the Home Depot story, this one is also entirely true, and while it is definitely a part of the Keys chronicle, as one of the more epic, harrowing debacles that occurred on our trip, I feel it is deserving of a post all on its own. Without further adieu, I give you – It’s About the Climb! The first thing Phillip said to me when I startled to rustle myself awake around 5:30 a.m. the next morning was “I have some bad news.” Seriously? I thought. We’d already lost the main halyard the night before when it went flying and wound itself around the backstay. What could be worse news? “It climbed its way back up the mast,” Phillip hollered down to me in the saloon. Up the mast? Climbed? It? I shook my head a few times and rubbed my eyes trying to piece together what he was telling me. “The what did?” I asked, still a little groggy. “The halyard,” he said. “It’s at the top of the mast.” Although his words made sense, I didn’t really understand how it could have happened. The last time I saw our main halyard – that turd – it was wrapped a couple of times around the backstay, too high up to reach, but it was secure for the moment. By all appearances, it was going to stay there until the morning when we could fetch it in broad daylight. I had never suspected anything otherwise. How could it have possibly snaked its way back up the mast? Not that I didn’t believe him, but I had to step up into the cockpit to see for myself. And, there it was. Our main halyard. Waaaayy up at the top of the mast, giving us a friendly little wave from way upon high. That turd! Apparently, the weight of the line from below was enough to counter-balance the length of line that was out and the shackle, particularly when it was wound around the backstay. As a result, the shackle had eventually creeped its way all the way back up to the top of the mast. Unfortunately, a BIG part of sailing is the ability to raise the sails. There was no way around it … Phillip and I weren’t going to be doing any sailing until one of us climbed the mast to bring that halyard back down. We were still out in the Gulf, about 5-6 hours from Clearwater, with favorable wind, and we had already been motoring through the night. Sailing was really the best option. We made some coffee and assessed the situation. The seas were relatively calm that morning. 2-3 foot swells, approximately 3-4 second intervals, but they were quartering us on the port bow so the boat was rocking gently over them. It was a moderately smooth sea state. Rocking gently below, however, is perceived far differently 50 feet up in the air. Think back on those days when, as a child, you climbed to the top of a tall tree. One that appears to be standing still on the ground, and it surprises how much it actually sways from side to side in the wind, once you make it to the very top. The same principle applies to the mast of a sailboat. As you have probably already guessed, I drew the short straw and was deemed the lucky deck-hand to climb the mast, which I have done several times now over the course of my short sailing career, but all of those times occurred when the boat was docked safely at the marina, not while underway. And, not while using a back-up halyard as my main hoisting line. You see, the problem with having to ascend the mast to get your main halyard back down is that you can’t use the main halyard (typically your strongest line for hoisting heavy objects) to do it. After some examination of the mast, it was determined we would have to use the spinnaker halyard because it was the only one that would allow me to get to the top of the mast. The others (the topping lift for the spinnaker, the inner forestay for the staysail, and the halyard for the staysail) all stopped short a few feet before the top of the mast – where the main halyard was gayly waving down at us. I had to be able to get all the way to the top to retrieve it. Which, in and of itself is fine. The spinnaker halyard, in theory, should be plenty strong enough to raise me, but we had yet to use ours on the boat (we’re far more leisure cruisers than racers – hence, no real need for a spinnaker) and the thought of using it for the first time to raise yours truly 50 feet into the air made both Phillip and I a little uneasy, but it was our only option. Plus, I weigh less, which makes me the obvious choice for ascending. To be safe, though, Phillip decided to secure the halyard for the staysail to me as a back-up safety line. It would at least catch me a few feet below the top of the mast if, for whatever reason, the spinnaker halyard failed. The decision had been made. It was time to get to it. Might as well get it over with. The sooner the better. We left some coffee warm in our mugs and set to it. Now, I don’t think I will ruin the surprise by telling you this was one of the scariest moments of the trip for me. Trust me, there’s more, but this ascension was both breath-taking and harrowing. It was an experience I don’t believe I will ever trade, but I’m not sure it’s one I will readily repeat. After some discussion, Phillip and I decided to latch our gaff to me so I could use it to snag the halyard in case it was just a few feet or inches out of my reach. A great plan in theory, an epic failure in execution. We tied a length of line (approximately 3 ft) to the end of the gaff, and latched that to my bosun’s chair, so it would be secured to me in a fashion that I could hoist and use it while still having it secured to my bosun’s chair. And, so it wouldn’t swing wildly 3 ft beneath me, we also secured the gaff itself to the back of my chair. Now, with all of this line-tying, back-up safety rigging and gaff-fastening I do wish we had thought to send a camera up with me so I could have taken some photos and footage from those great heights, but with everything we had going on, I’ll admit the thought never crossed our mind. This time. So, once I was tied three ways to Sunday, we started the ascension, with me, starting from atop the boom, and Phillip working all of the lines from the cockpit. We had also been fighting nightly banging from our inner forestay during this trip, so we decided one other item to accomplish during this ascension was going to be removing the forestay. We figured we could easily ascend again to re-mount it on the off-chance we would need it on this trip. A decision we would regret later, but that was then, not now. Hindsight … One unfortunate consequence of ascending using the spinnaker halyard is that it comes out on the fore- (bow) side of the mast so I had to climb on the front side of the mast. Unfortunately, there are several blocks and pulleys, and a steaming light on the front of the mast that caused some pain as I was scraped and pulled across them and proved decidedly fatal for our steaming light. As I was ascending, I was watching the spinnaker halyard at the top of the mast, watching my back-up safety line as Phillip intermittently cranked it in, and checking periodically to make sure my gaff was still attached and I noticed at one point that the knot for my back-up line was riding just below the steaming light on the front of the mast. I hollered to Phillip to “STOP” cranking the safety line, but with my being approximately 25 feet up already and the wind and waves, he didn’t hear me, and the knot caught tight underneath the light, unfortunately shattering and cracking it as Phillip hoisted me up a few cranks. I hated to see it happen, but thankfully, it’s not one of the more crucial lights on the mast. So … c’est la vie. It was about that time, though, that the “treetop” phenomenon I mentioned earlier really started to kick in, and it became far more crucial that I cling to the mast, with both legs and arms wrapped tightly around and clinched tightly together on the other side of the mast, rather than use my hands to check or grab anything. The mild 2-3 ft rollers we had felt below, felt like 4-5 ft rollers at 30 feet, and I was struggling a bit merely to keep my body wrapped around the mast, much less ascend it. With the exaggerated rocking to and fro, and my hands otherwise occupied around the mast, it was about that time that the gaff came unfastened from my bosun’s chair and fell the 3 ft length of line we had tied to it and began swinging and clanging wildly against the backs of my calves, my feet and the mast. Nothing I could do about it but hold firm when I knew it was whipping back to potentially strike me. It made quite a rucus banging around up there, but, I’ll tell you, the worst sound was the groaning and creaking of the spinnaker halyard. You would have thought I weighed 400 pounds the way that thing was carrying on. I could see Phillip cranking hard below, 4, 5, 6 times around with the winch, but the halyard would only seem to pull me up three inches, maybe four, while letting out a gut-wrenching wail of exhaustion. I will say there are times that I doubted it, and I vowed never to lose my kung-fu thigh death grip on the mast at any point in time. Luckily, I made it to the inner forestay mount with no real issue, and I was able to unhook the inner forestay with some ease but lowering it down to Phillip proved to be a bit more of a problem. Recall the 2-3 ft rollers, which felt like 5-6 ft rollers from up there, plus the wind and the gaff I’ve got swinging about and all of the other lines and shrouds and the spreaders and the lazy jacks that entangle the passage on the way down. Getting the forestay down to Phillip on the deck, without it getting caught in all of the mess, was a bit of a challenge and one that was exhausting me a bit while I was still utilizing the kung-fu thigh grip to keep my body fastened tightly to the mast. But, I got it down to him, and we set about raising me the remaining 10 or so feet to accomplish our main objective – retrieving the main halyard. I’ll never forget as I watched Phillip make his way back to the cockpit so he could set to work, cranking on the winch again, I heard a hollow, aluminum pop behind me – the gaff on the mast again – but this time a light tug on my rear and then a bit of a weightless release, and there it went. The gaff. I watched it fly freely, end over end, over the bimini, past the stern, twirling lightly in the wind, before it landed in the water a good thirty feet behind the boat. The thing is four feet, easily, and it looked like a toothpick being flicked into the wind. I suddenly felt so incredibly small, so frighteningly insubstantial. I think that’s about the time the real fear kicked in. I knew now I didn’t have any kind of magic extender to help me reach out to grab the halyard when I got to the top and stretching to it would likely mean releasing my thighs from the mast – a proposition I was not yet willing to entertain as I was still swinging wildly three feet one way, back three feet another from the waves. I knew if I lost my grip on the mast and swung out, I would have no control on where I banged back and the pressure and added force on the spinnaker halyard just might be too much. I didn’t want to ponder it. I just clung tight to the mast. But, I was already up there. It was now or never. Just a few more feet. Phillip and I both watched the gaff hit the water and float away. We met eyes for a moment and simultaneously decided there was nothing that could be done. It was gone. Phillip shrugged his shoulders and shouted, “You ready?” I hollered a mighty “Yes!” back, that I hoped sounded braver than I felt. The last few feet up the mast seemed to be the most straining on the spinnaker halyard. I watched Phillip crank, around and around, and felt myself inch up the mast at a snail’s pace. But, finally, the knot on spinnaker halyard reached the pulley at the top and I knew there was nothing more that Phillip could do. I shouted for him to “Stop!” and I set my sights on the halyard. It was probably about 10 inches out of my reach with my weight resting on the halyard. So close. I knew I was going to have to climb the last foot on my own, and hoped I could reach the halyard without having to un-clutch my thighs from the mast. I could feel my legs shaking, both from exhaustion and fear, as I clinched tightly, waiting for the boat to make its way over a set of rollers. I looked out on the horizon, like a surfer trying to find a calm break in the sea state so I could make my move. The mast tipped wildly back and forth a few times as a few waves rolled underfoot and I saw a few seconds of calm ahead. 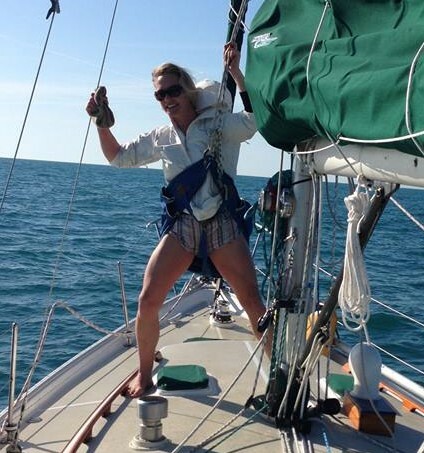 I clinched and scooched my way up a few inches, watched the spinnaker halyard loosen and released my legs from the mast for just a moment to push my body up the mast and grab the halyard before I quickly wiggled my way back down. The tug of the spinnaker halyard, while cutting viciously into my thighs, was now a welcomed feeling. I clung tightly back to the mast just before another set of rollers came through. I had got it. The main halyard! While the moment was exhilirating. I was exhausted. My calf muscles were shaking, and I really was facing a substantial fear that something could still go wrong, and I was still 50 feet in the air. I hollered to Phillip that I had the halyard, and he came up on deck for me to lower it to him. We faced, again, the same problem of easing the halyard back down correctly around the shrouds and spreaders and stack pack lines (it would accomplish nothing if we wound it down around something that would prevent us from raising the main), but after some time, I was relieved to finally see it fly into Phillip’s hand. He clipped it to the boom and went back around to the cockpit to begin lowering me. As I watched him make his way, though, I was again shocked to watch the scene unfold below. “The halyard!” I screamed down to Phillip. “I know!” he shouted. “I’ve got to get the winch handle on!,” a bit perturbed. I will say it is easy to be focused on your own issues in stressful times like these and to snap curtly, even at your most trusted mates, when you think they’re telling you something you already know. He thought I was talking about the spinnaker halyard and that I was trying to tell him to hurry up and get me down. Which, of course he’s working as fast as he can to do that. Such a comment probably would have irritated me, too. If that’s what I had been talking about. But, it wasn’t the spinnaker halyard. It was the main. Flying wildly again! I couldn’t believe I was actually seeing it. The same problem we had just faced the evening before, and the whole cause of this death-defying circus act, and there it was swaying violently above the deck. Again. That turd! “No, the MAIN!” Phillip craned his head around to where the main had been shackled only to find it flailing around again like a ribbon in the wind. I heard a crash and saw a flurry of arms and knees and elbows before Phillip emerged again from the cockpit. I hate to say it, but from way up there, he looked like a circus clown trying to put out a fire with a seltzer bottle. I swear I could hear carnival music playing in the background. Luckily the main halyard hadn’t been able to swing that long and it was still long enough that Phillip could reach it. He snatched it again, clipped it again and stared at it sternly as if to say, “Don’t you even think about it,” before focusing back on the winch. He gave me a swift look to make sure I was still swaying up at the top of the mast. Yep, still up here. Then he set back to readying the winch and letting out the spinnaker halyard so I could come down. Funny thing was, he would forget on occasion about the back-up safety line, the staysail halyard, he had hooked up to me. He would oftentimes let out a couple of feet on the spinnaker halyard, look up at me – only to find me in the exact same position – and say “Let go!” As if I would stay up here for fun … “The safety line!” I would holler back, and he would immediately jump to the secondary winch and let out some safety line and then I would come down a few feet. He managed this back and forth all the way down and I can’t tell you how thrilling it felt when my feet finally touched down on the boom. Ahhh … solid footing. My leg muscles were still shaking from the anxiety and my inner thighs were already mottled with rope burns and bruises, but I didn’t care. I was down, and so was the halyard. First Mate – just after touching down. “No more mast climbs this trip,” I thought. We both thought. But, that wouldn’t be the case. Fortunately, this one, though, our first while underway, was accomplished safely with only two minor casualties – the gaff and the steaming light – both of which we considered minor losses in light of the feat. We have a secondary gaff that we use for hauling fish on-board which would surely suffice, and the steaming light isn’t critical. Oh, but there was the little matter of the coffee, and the solar shower. When I finally made it back to the cockpit, I was welcomed to the scene Phillip had been slushing around in during the whole ordeal. The crash that I had heard earlier was him bumping the cup holders that were holstering our coffee mugs. It looked like a mocha murder scene in the cockpit. And, he’d managed to step on the spigot for the solar shower that was sitting in the cockpit floor, crunching it into pieces. But, it still seemed to work … somewhat. Still, minor losses, considering. In all, it was quite the accomplishment for the day. Another mist climb down, our main halyard once again securely in hand, and we were not (too much) worse for the wear. We hoisted the main, made a second pot of coffee and set our sights on Clearwater. 11 Responses to April 11, 2014 – It’s About the Climb! Um, I am starting to think that “adventures in glitter exploration” are safer and even more sensible than sailing the open seas. Can’t you train a pet monkey to do those tasks? But then you have have to have it flown in by helicopter whenever the problem arises. Ha ha HAAA!! They probably are, but I like it all my friend. I like it all. But I like your monkey idea. No flying him in, we’d just keep him stored with the dry cargo!! The mast climb at sea was definitely an adventure! You are spot on with the description of climbing the mast. The creaking of the rope and the distance you have to go up. It’s like as close to “sudden and tragic death” you can go. Even though I knew I was safe It was really wild going all the way up there. The creaking of the rope is the worst. When I went up with the spinnaker halyard I could literally see Phillip crank the winch three or four times and move up like a centimeter! Creeeraaak! I know this is old post, but after stumbling upon your blog, I decided to start at the beginning and read all the way through. Any how, I was just wondering, wouldn’t a stopper knot at the end of the halyard have prevented this whole misadventure? Hey JD! Reading all the way through. Boy, you’re brave! I hope you’re enjoying it. On our boat, it would not. A knot at the bitter end (back in the cockpit) would only prevent the halyard from coming out through the clutch (i.e., going out of the mast), not down into it, as it did in our case, leaving the shackle head waving down to us from the top of the mast. There can be no knot between the shackle and the top of the mast as the halyard has to go down into the mast to raise the sail (and you wouldn’t want a knot anywhere on the line that could be pulled so taut it would never come undone). I hope that helps. The mistake we made was to unclip the halyard from the mainsail (and in particular, try to re-clip it while under way — you’ll see later in the blog that almost cost us a very severe injury). We now never unclip it, just cinch it back. Learn as you go! I hope that makes sense. Glad to have you following along!